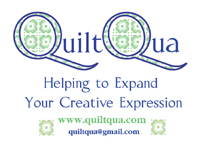 I’m not talking about this – but when I first saw the title of the quilt in Millefiori Quilts 3, I couldn’t help but think of the psychedelic colours and vans painted with flowers of the late ’60s and early ’70s and oh, the music. Funny how two little words can be SO evocative!! But no, I’m not talking about that. 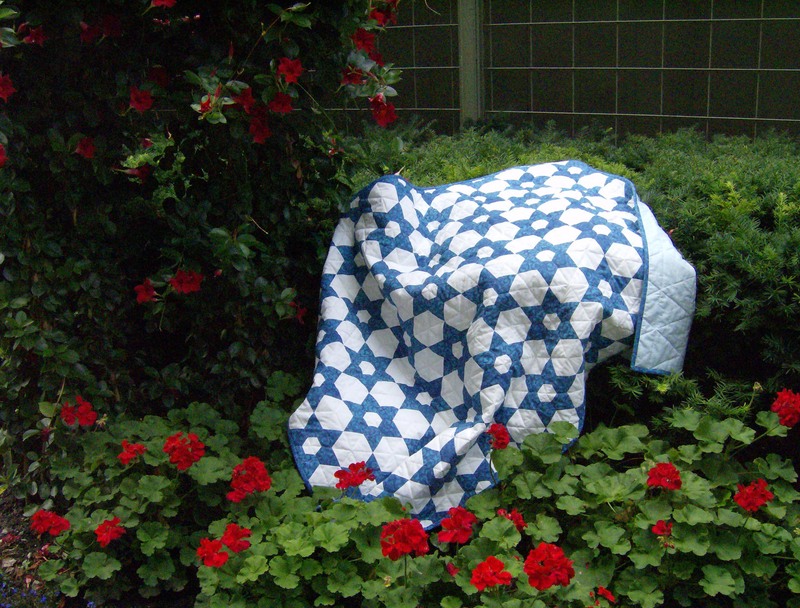 Instead, I’m talking about this – the centre of Willyne Hammerstein’s Flower Power quilt from Millefiori Quilts 3. When I first got the book, I was immediately drawn to this quilt. I could see loads of possibilities – especially with some bright colours and fussy cutting. The name could possibly have been part of the attraction as well. On Friday, an Inklingo collection was released – a slightly larger Flower Power add-on collection that works with the 1″ 60-degree diamond collection and, of course, I couldn’t resist. I had to make a test block just for the fun of it because if anything other than curved piecing could draw me away from the Silent Garden and Harpsichord tops, it was playtime with 1″ 60-degree diamonds. It took only a couple of minutes to get the fabrics printed with the shapes. The diamonds for the centre star were already printed and waiting in a project box so all I needed to do was print the partial hexagons and yellow diamonds. I had to make something rather bright and cheerful but it’s not anywhere near as bright and cheerful as I’d like and what I’m planning when I make a Flower Power quilt because – well, how could I not want to work with some really bright and cheerful colours, given that name? Its back, after I graded the seams and pressed it. It’s a fun block to sew – there are loads of opportunities for continuous piecing, which I always look for as it means a block goes together quicker than it may appear and it’s fun to plan how to sew to take advantage of any continuous piecing opportunities there are. I admit – I had other ideas when the collection came out. Initially I thought maybe something with an elegant floral fussy cut/printed for the centres and some fun coordinating colours but no, that sounds really quite boring for this one. Then I thought perhaps something that started with stars made with ’30s prints would work, because they are very cheerful and I seem to always have some of those made and more ready to sew, such as this little group of stars that have been sitting waiting for me to sew more and then figure out a setting. They would have lots of others from this project box of 1-inch ’30s diamonds just waiting to be turned into stars. But no, not the ’30s diamonds. No, neither of those ideas are going to work. 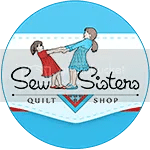 Instead I want to make a quilt that will be bright and cheerful and hopefully capture the feeling I got when I read the name of the quilt initially. It makes me smile just thinking of it. All I needed to say to Mr. Q.O. was flower power and he was immediately drawing this ‘toon. I had no idea what he was drawing until I saw the finished ‘toon – and I can’t help but laugh with delight every time I look at it! “Again with the camera, lady?” has to be the caption for the look on Jake’s face. It also makes me laugh with delight when I look at the photo. Cats really do have the most expressive looks! Baxter was very intent on watching something out on the roof garden. Nothing could distract him for a few minutes – and I couldn’t see a thing, so who knows what he was staring at. I knew this would be coming! Another project to keep you busy! And I am still waiting for the “toon” book to be published! Those cats are so funny! The toon has the colours right there, bright, and so into that 60’s look!!! I can see this in really bright and crisp fabrics, a change from your beautiful shaded ones? Maybe Mr Q.O. is being a little suggestive!! Me smile. I remember flower power era. Guess I’m getting older lol. Still young at heart and mind.